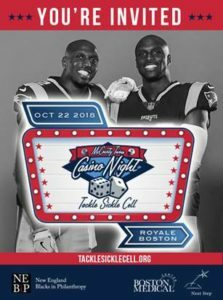 On October 22, 2018, NEBiP joined Boston Medical Center, New England Patriots safety and two-time Super Bowl champion Devin McCourty and New England Patriots cornerback Jason McCourty to host Tackle Sickle Cell Casino Night, in support of BMC’s Center of Excellence in Sickle Cell Disease. BMC’s Center of Excellence in Sickle Cell Disease is the largest center of its kind in New England, serving more than 450 patients annually, from newborns to adults. Held in downtown Boston, guests enjoyed a lively evening of casino games, cocktails, networking and socializing alongside their favorite Patriots players. Funds raised from the event will “tackle sickle cell,” by helping to provide life-saving care for BMC’s patients who suffer from sickle cell disease and working to find a cure for sickle cell disease. Click here for news coverage of this important event.